This plot is over! You may still complete some steps to receive some of the prizes. You will not, however, receive a trophy or any of the final prizes. Thank you for sticking with Jellyneo! Below, you'll find the latest updates and information on the Atlas of the Ancients plot, so be sure to keep checking back! 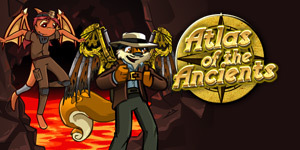 Visit the Atlas Of The Ancients page to collect your reward! 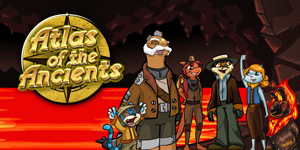 You will receive the Atlas Of the Ancients site theme, an avatar, and some exclusive items. You can view the full list of prizes here. Next time you won't be so lucky! Glitch update: If you collected your prize right after the new features updated, you may not have been awarded the proper items or trophy. Users have now reported getting the correct prizes. Feel free to submit a bug report to TNT using the contact form if you are still experiencing a glitch. Atlas Of The Ancients - Avatar And Prizes! We do not know the solution yet. You will most likely receive this avatar as some final reward for participating in the plot. 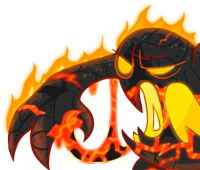 With the plot possibly coming to a close either today or within the week, there's a question that still remains on everybody's mind: how will we get one of those fab new magma pets? Obviously, the first possibility is a paint brush. However, there's some speculation as to other possible methods, namely, a special magma pool. Similar to the Rainbow Pool in Faerieland, it's thought that the magma pool below might be a bit special, especially in regards to our pets. Will there be a magma paint brush? If no PB, is the magma pool a possibility? 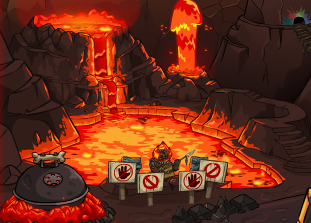 How will we get access to this hypothetical magma pool? Will access to the pool be a final plot prize only? Or, will there be some new faerie quests similar to the Fountain Faerie Quests? What are your thoughts on everything? Post and discuss in our comments while we wait for the news! Chapter 12 is here! And indeed, the Atlas of the Ancients plot is now over. Stay tuned to JN over the next couple of days, as we'd like to get your opinion on the plot as a whole--what was good, what was bad, what you liked/disliked, etc. Until then, check out the Games Master Challenge! A new peril has arisen in Chapter 11. Welcome to the Moltara Caves, home of Magma pets! This page was last updated on May 2, 2010.